“Center Market Opens,” Histories of the National Mall, accessed April 22, 2019, http://mallhistory.org/items/show/165. 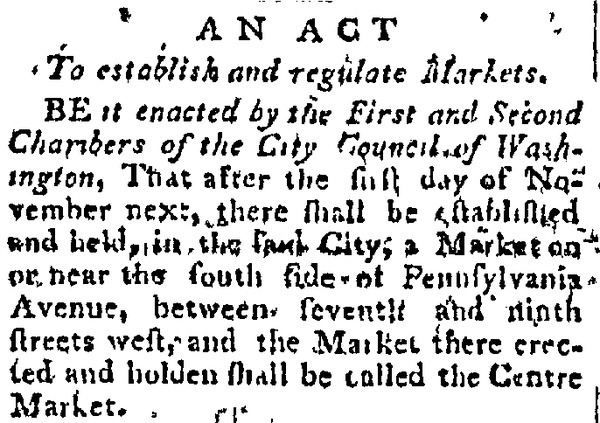 The Center Market, one of the first formal markets in Washington City, opened in mid-December 1801. The market's location was proposed in the early plans of the city and George Washington had set aside land for its establishment in March 1797. Laws governing the market encouraged local farmers to bring their products into the city and contributed rental revenues to the city's poor fund. The market was near Tiber Creek, the planned route of the Washington City Canal, which provided easy transportation. National Intelligencer, October 11, 1802.